I feel like I’ve stumbled upon gold with this recipe, guys. This Roasted Broccoli Salad with Almonds uses almost all ingredients that I keep on hand, and is so good that I was literally shoveling it into my mouth as I was taking photos. 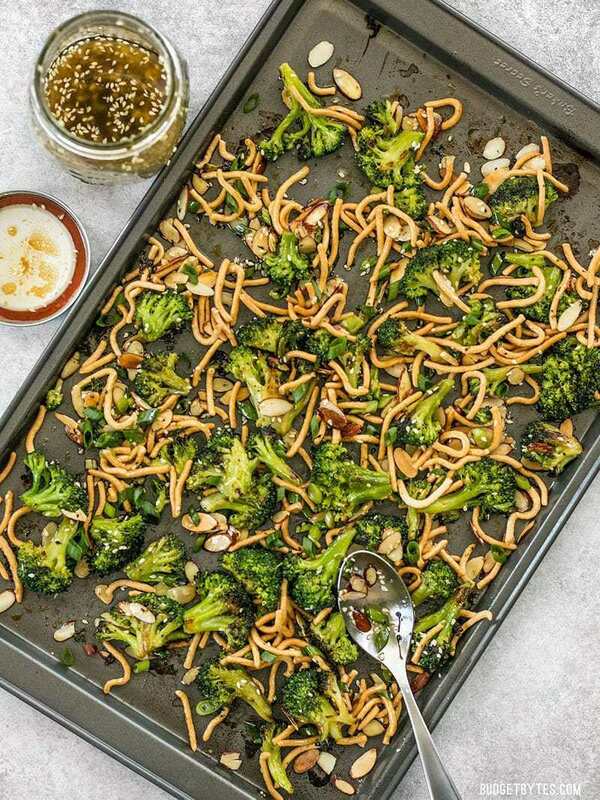 Thank goodness the crunch lo mein noodles come in a really big bag, because I’ll be making this Roasted Broccoli Salad with almonds again several times in the next couple of weeks. 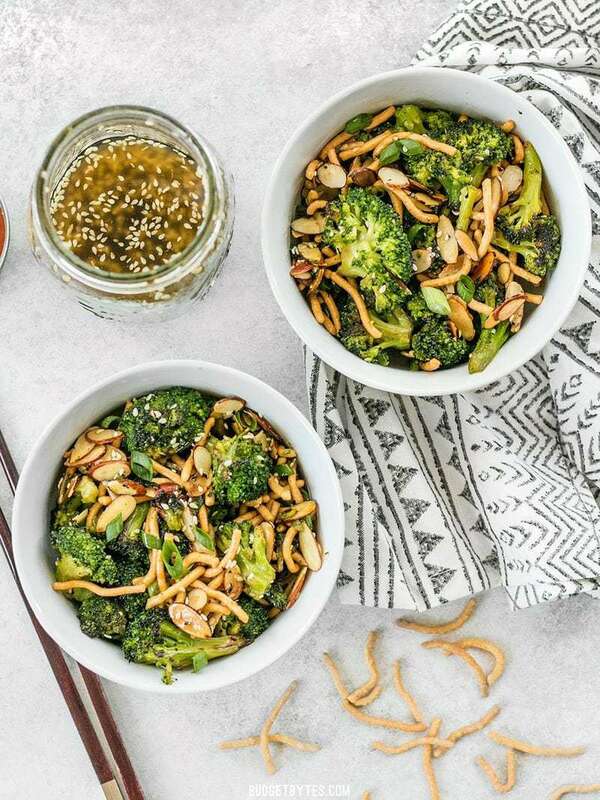 While I love the what the crunchy chow mein noodles bring to the texture of this salad, I already know some of you will want to know what you can use in their place. 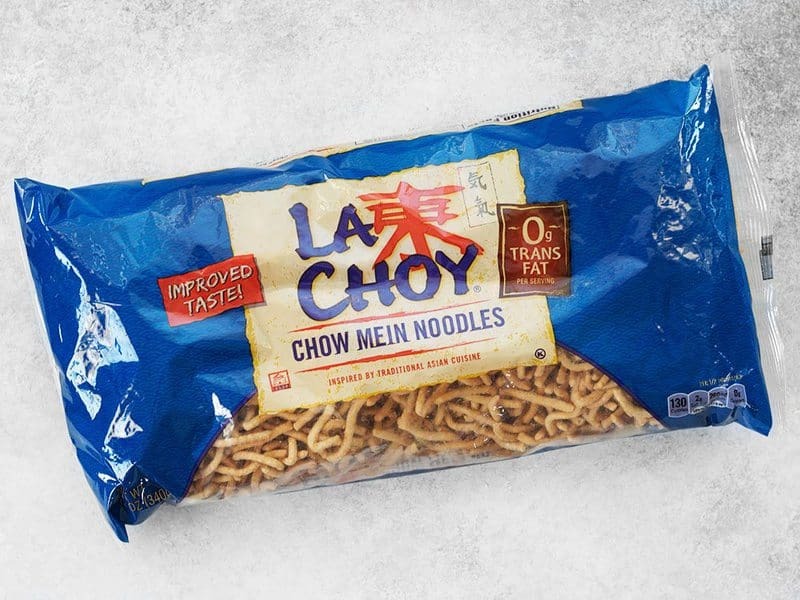 If you just don’t want to buy chow mein noodles, you could use a brick of uncooked ramen noodles broken up, or if you’re looking to make this a little more low-carb, you can double the broccoli and just skip the crunchy noodles all together. I wouldn’t suggest skipping the sugar in the dressing, though, because it is absolutely critical to balancing the salt and acid in the dressing. Should I Use Fresh or Frozen Broccoli? You can use either fresh or frozen broccoli florets, just be aware that fresh may take a different amount of time to roast. When roasting vegetables it’s always a good idea to keep an eye on them anyway, since the size of the vegetable and differences in oven temperatures can change roasting time quite a bit. How Do Leftovers of Roasted Broccoli Salad Hold Up? Leftovers of this recipe are okay, but it’s definitely best fresh. Luckily, this makes a small-ish batch. It will make four small side servings, or two larger servings. 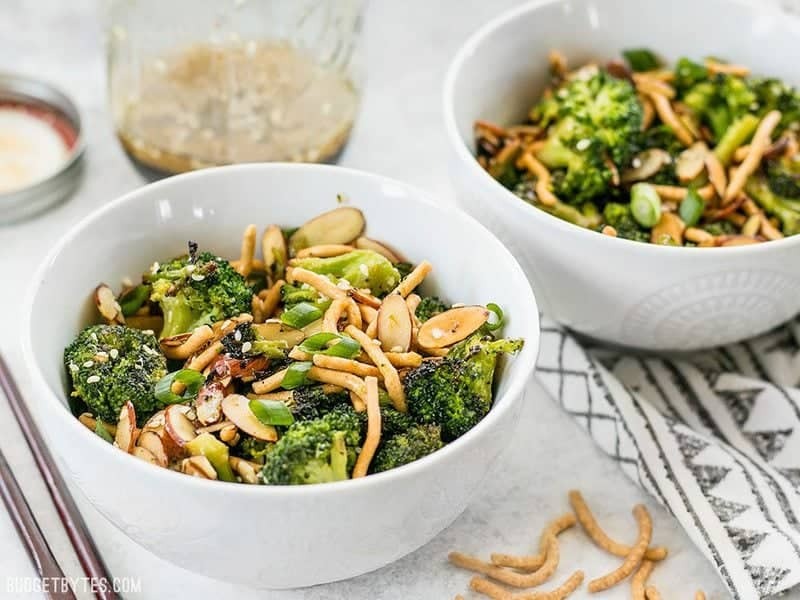 This crunchy, sweet, and salty Roasted Broccoli Salad with Almonds is my favorite way to get my vegetables and goes great with any Asian inspired meal. Make the dressing first to allow the flavors time to blend. 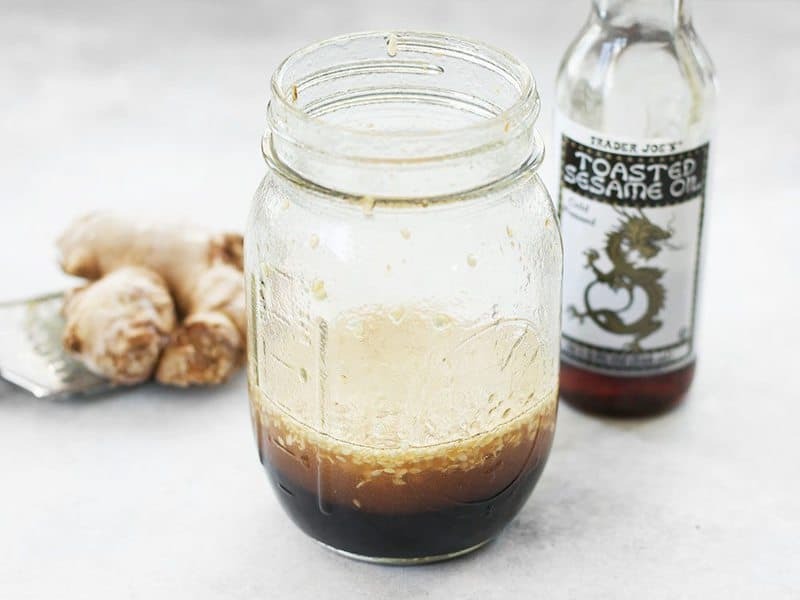 Add the oil, rice vinegar, soy sauce, toasted sesame oil, brown sugar, fresh grated ginger, and sesame seeds to a small jar or bowl. Whisk the ingredients together or close the jar and shake to combine. Set the dressing aside until ready to use. 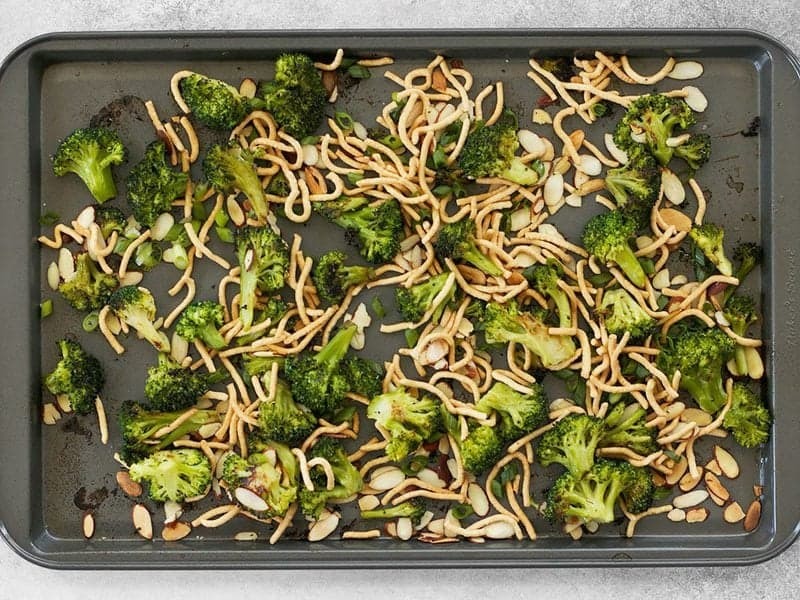 Spread the broccoli florets out on a baking sheet. Begin to preheat the oven to 400ºF. Place the baking sheet with broccoli on the stove top as the oven preheats to allow them to begin to thaw. Once the broccoli is soft enough to slice, cut any large florets into smaller bite-sized pieces. Drizzle the broccoli with 1 Tbsp oil and and pinch of salt, and toss to coat. Roast the broccoli for 30 minutes in the preheated oven, stirring after 20 minutes. Sprinkle the sliced almonds over the broccoli after 25 minutes, and allow them to roast together for the final five minutes. 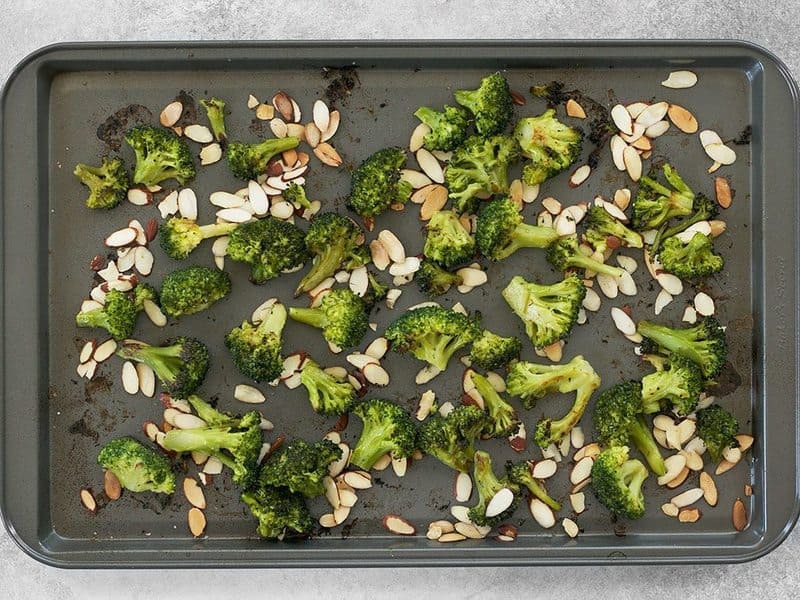 Take the broccoli and almonds out of the oven and allow them to cool (5-10 minutes). Once the broccoli is mostly cooled, add the crunchy lo mein noodles and sliced green onions, and stir to combine. Give the simple sesame dressing another stir or shake, and then drizzle the dressing over the baking sheet. Stir until everything is coated in dressing. Serve immediately. *Use any light flavored oil, like canola, vegetable, safflower, light olive, or untoasted sesame oil. Start by making the simple sesame dressing so that the flavors have time to blend (this is actually a double batch pictured). In a jar or bowl combine 2 Tbsp neutral or light oil (I used canola), 1 Tbsp rice vinegar, 4 tsp soy sauce, 1 tsp toasted sesame oil (pictured on right), 1 Tbsp brown sugar, 1 tsp freshly grated ginger, and 1/2 Tbsp sesame seeds. Whisk the ingredients together or place a lid on the jar and shake until combined. Set the dressing aside. Spread 1 lb. of frozen broccoli florets out on a baking sheet. Begin to preheat the oven to 400ºF. 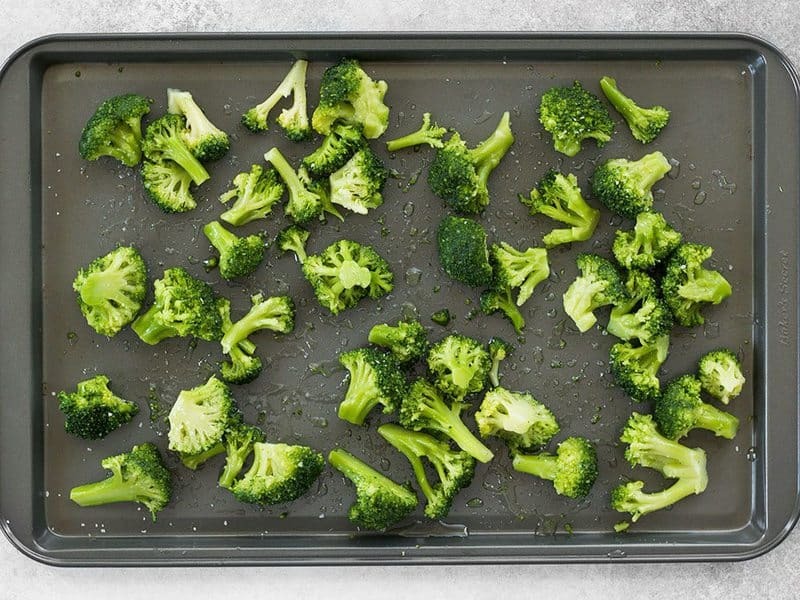 Place the baking sheet with the broccoli on the stove as the oven preheats so that they can begin to thaw. Once they’re soft enough to cut, slice any larger florets into smaller bite-sized pieces. 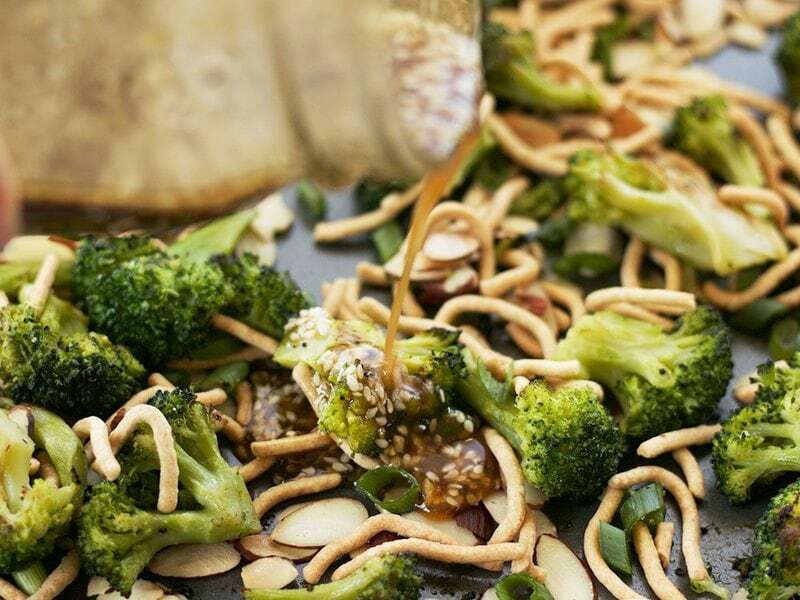 Drizzle the broccoli with 1 Tbsp oil and toss to coat. Add a pinch of salt to the broccoli. Roast the broccoli florets for 30 minutes total, stirring after 20 minutes, and adding 1/3 cup sliced almonds after about 25 minutes (roast the almonds with the broccoli for the last five minutes). Allow the broccoli to cool for 5-10 minutes. Add 1 cup crunchy chow mein noodles and two sliced green onions, and stir to combine. This is what the noodles look like, if you’re looking for them in the store. It’s quite a large bag, but I plan to make this salad again and again. :) If you have any other favorite recipes that you like to use these for, please share in the comments below! Finally, give the dressing one last stir or shake, then drizzle it over the salad. Stir until everything is coated in dressing. And that’s it! 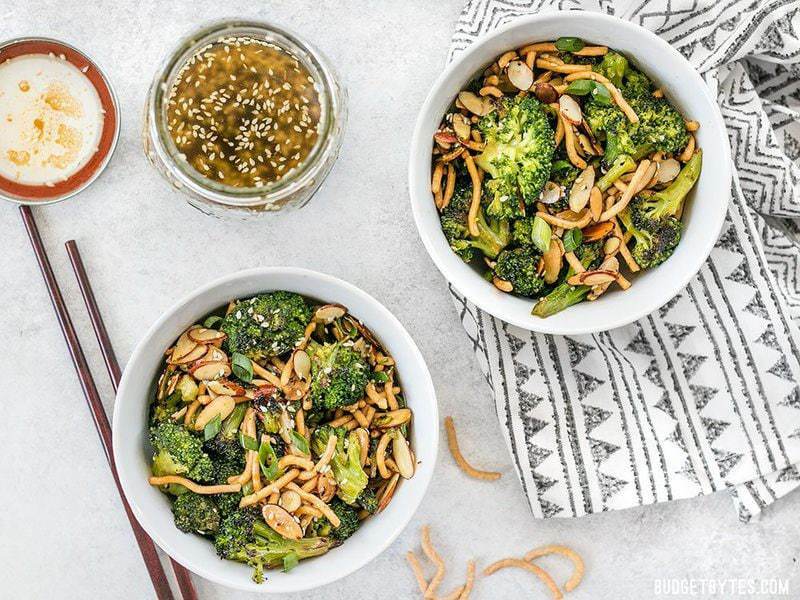 This Roasted Broccoli Salad with Almonds is ready to devour! Super good!! :) To reduce calories I used 20oz broccoli, half of the crunchies & about 2/3 or the dressing. Tossed it in a Tupperware instead of on the pan. I’ve been inspired by your Vegetarian Challenge! I’m not quite ready to go veggie (I’m going to try Meatless Mondays!) but I definitely need more green things in my diet. This salad will on my table tonight and I’ve grabbed a few others for the rest of the week! I love your site! I’ve made this a few times, incredibly delicious! This one is SO good! The first time I made it, I meant to portion it out for later, but just ended up eating a big bowl full in front of the television that day… I like pairing it with the chili garlic tofu snagged from one of your bowl recipes, it makes for the best lunch! 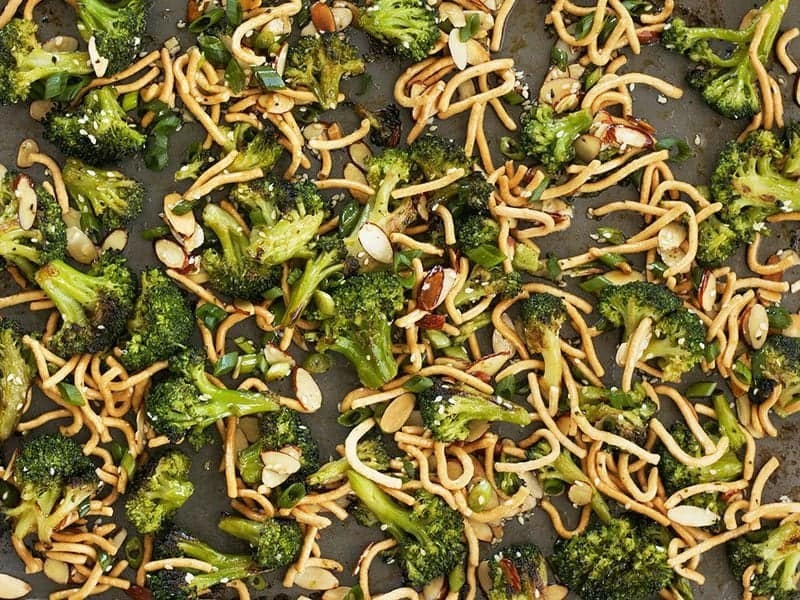 I noticed that reviewers are commenting about the Broccoli-Sesame salad dish being soggy. Maybe they are not thawing/draining frozen veg in a colander and patting it dry before applying the oil. Perhaps, if a note is attached at the end of the recipe, that may eliminate the problem. Personally, I use fresh in the recipe and do not have any isssues, other that making sure the broccoli is overdone. I’ve also tried it on the grill, preheated, medium-high heat for about 15 minutes and the results is great. Also, the tasty dressing is my go-to for broccoli or green bean sides. Keep up the good work!. Love! Love! Love! this recipe. Tastes just like a restaurant quality, but I made it at home! So good! SOOO good!! Love this recipe! Followed the recipe to a T, but the broccoli turned out soggy, presumably because of all the ice that was on it. It was nearly inedible so we ended up tossing it.